The 10 Best Caterers in Louisiana! Any time is a good time to celebrate a special occasion, but sometimes you need a little help planning, organizing, and preparing the food and supplies. No matter what special event you’re planning, these excellent caterers in Louisiana can help make sure your day comes off without a problem. You can be worry free knowing that every detail is in professional hands and enjoy the party yourself. For more than 20 years, Cashio’s Catering has been providing top-notch food services to the community of Thibodaux, Louisiana. No matter if you’re celebrating a birthday, wedding, anniversary, graduation, corporate event, or just life in general, you can ask for a free consultation and quote to help make your event the best it can be. This mobile food company knows how to do Cajun food right like jambalaya, gumbo, crawfish, etouffee, seafood, and more, and can set up grilling, oyster, and carving stations, a sushi bar, or whatever you have in mind from appetizers to desserts. They also have tables, chairs, tents, linens, and fountains available for rent. Carpool Caterer, a locally owned and operated food service serving the Covington and Mandeville, Louisiana area, loves bringing people to the table and providing healthy foods that bring smiles and encourage a sense of community and closeness. You’ll have healthy menu choices that can accommodate the pickiest palates, and there’s a kid’s menu with time- and kid-tested favorites. What’s unique with this catering company is that you can review their menu that changes weekly and place your order online for pickup later. If you’re running late and need your food delivered, they can do that for a modest fee. 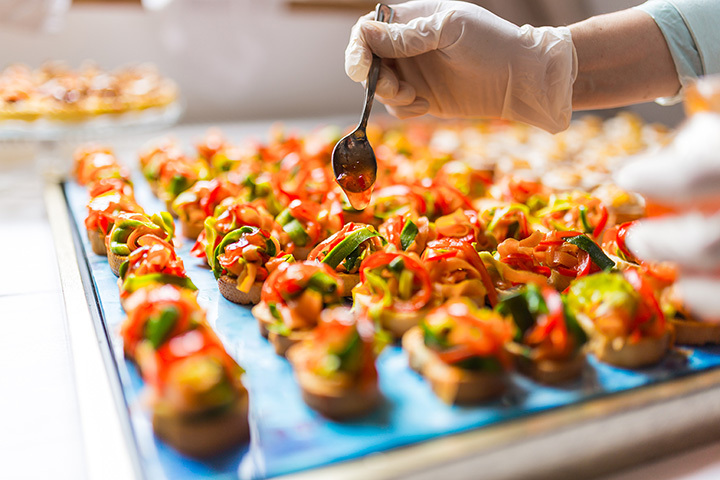 This premier catering company specializes in keeping event planning simple and easy. Brent’s Catering, located in Grand Coteau, Louisiana, offers an award-winning menu of items that will make your mouth water. This family owned and run business loves bringing good food and good people together. With a nice variety of jambalayas, pastas, appetizers, sandwiches, dips, and soups, the only problem you’ll have is deciding what to order. Plates, forks, cups, tablecloths, and napkins are included with each order, as is the set-up and clean-up services. The passion for food is what started Catering by Don, and that passion is what keeps it going. With a winning combination of quality service and great food, this local catering and food service company located in Covington, Louisiana offers casual and sophisticated events from your next family picnic to elaborate wedding receptions to corporate and business affairs. They also offer a full bar service for events and their signature items includes spinach Andouille, bacon-wrapped Andouie shrimp, pork ribeye, stuffed duck breast, and crabmeat dip, to name a few. Looking for something different for lunch? Need help planning your next business event? Contact ETC. Catering & Flowers in Bastrop, Louisiana where quality and great customer service is what you can expect. This local catering company is well-experienced in handling corporate and political luncheons, but don’t avoid smaller events like family parties. They have a delicious menu with items that range from casseroles to salads to the best strawberry cupcakes and chocolate fudge around. Open Tuesday through Thursday, call for help planning your next event large or small. Available for catering services, plated lunches, and other specialty items every day except Sundays, Boarding House Catering in Lake Charles has been a local and family-owned business for more than 30 years. Don’t let the holidays or the next special event make you crazy. Contact the friendly folks at The Boarding House and let them help take the stress away. With excellent customer service and high social media approvals, the chicken salad is at the top of the list for favorite menu items. If it involves food, NOLA Girl Catering has you covered. Located in New Orleans and serving that area, NOLA Girl offers onsite catering for private and business events, standalone drop-off catering services, delivered lunches, food truck services, and can provide a personal chef for your next party with friends in the comfort of your own home. No matter what service you need, NOLA Girl Catering will work with you to make it the best event. No matter what you need related to food and food service, you can count on Chef Eric Johnson & Company to help. With a desire to set new culinary standards across northeastern Louisiana, you can talk to them about planning your wedding reception or a dinner party with friends. With a flair for classic French, Cajun, and Creole foods, Chef Eric will help you select the right menu with all the foods you love. If you like the idea of hosting a food event but don’t have a location, you can rent the new banquet room that holds up to 60 people. Located inside the Surgical Special Center in Baton Rouge, Louisiana, John & Anna’s Coffee Bean Café and Catering offers a great eat-in lunch that won’t disappoint. According to social media reviews, their catering services are second to none with large portions and reasonable prices. This up and coming catering service may be just what you need as you plan your next food event. With a deep desire to keep the unique Cajun culture of Louisiana alive through authentic food and to show appreciation for their community, The Cajun Table seeks to serve the hungry masses around Lafayette, Louisiana every day but Sunday. With humble and simple beginnings in 2015 as a food truck service that traveled all over the city sharing good food, The Cajun Table Restaurant opened its doors in 2017 with the same goal. Come in and enjoy the menu full of all things Cajun and listen to the live Zydeco music representing the area, too.